Sasa swimmers and officials celebrate their achievement at the grandstand of the Sarawak Aquatics Centre yesterday. 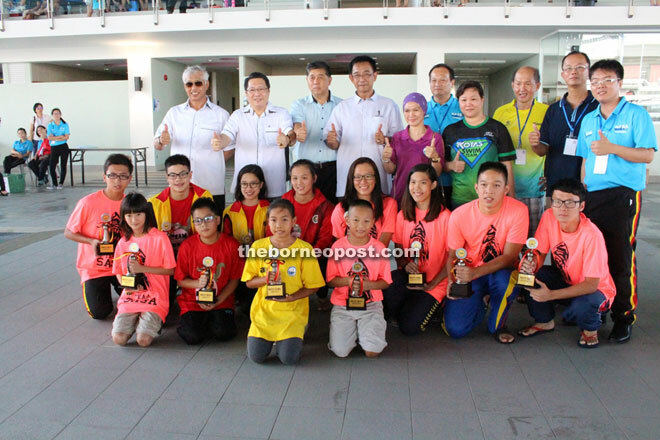 KUCHING: Three more records fell on the third and final day of the 43rd Sarawak Age Group Swimming Championships at the Sarawak Aquatic Centre at Petra Jaya yesterday as Sibu Amateur Swimming Association (Sasa) topped the meet with 69 gold, 63 silver and 48 bronze medals. Sasa’s Emily Wong Li Min cracked her second record in the championship yesterday when she splashed to a new time of 1:45.47s in the Girls Group E 100m breaststroke. The old record of 1:50.35s set in last year’s meet belonged to Ivy Ning Chai Yun also of Sasa. On Saturday, Emily had rewritten Ivy’s other record of 50.97s when she clocked 48.44s in the 50m breaststroke, making her the outright winner of the best swimmer award in this age category. Zachary Tan from the Kuching Amateur Swimming Association (Kasa) 2010 created of the meet’s third record in the Boys Group 2 50m freestyle with a time of 25.25s, chipping 0.02s off the old record of 25.27s set by Sasa’s Nee Gui Ping in 2015. The best boy and best girl swimmers posing with (from left) Wahab, Wee, Sarawak Sports Corporation CEO Dr Ong Kong Swee, Karim, organising chairman Anthony Kong (fifth right) and team managers after the awards presentation. He was adjudged the best swimmer in Boys Group 2 with his total medal haul of nine gold and one bronze. The day’s third record was set by the Kotas quartet in the Girls Group 5 4x100m freestyle relay when Sara Tham, Dalyshia Teo, Ong Chuan Yen and Bibienne Ong clocked 6:30.95s to erase the old record of 7:22.51s set by Sasa last year. Sukma swimmer Alex Tiong Sie Hung starred for Sasa, capturing 15 gold medals to land the Boys Open best swimmer award. Sasa earned more best swimmer awards through two more Sukma swimmers in Ngu Jiung Wei (Boys Group 1) and Cindy Sui Yea Zhen (Girls Group 1), Joey Wong (Boys Group 3), Timothy Wong (Boys Group 5) and Emily Wong (Girls Group 5). Kasa had a share of the honours, with Reagan Chong taking the Boys Group 4 best swimmer award, Mandy Teo the Girls Group 2 and Zia Tan the Girls Group 3. The Limbang Amateur Swimming Association (Lasa) representative Kristen Chong walked away with the Girls Group 4 best swimmer award. Kasa, which fielded 96 swimmers in this year’s meet, finished as the second best team with 47 gold, 42 silver and 40 bronze medals. Last year’s champions Kota Samarahan Amateur Swimming Association (Kotas), could only manage a medal haul of 30 gold, 30 silver and 29 bronze medals to finish third while Miri Amateur Swimming Association (Masa) were fourth with 24 gold, 23 silver and 26 bronze medals. The fifth to eighth spots were occupied by Lasa (11-5-6), Bintulu Amateur Swimming Association (Basa – 4-7-6), Kapit Amateur Swimming Association (Asak – 0-0-0) and Sasa Special Olympics (0-0-0). 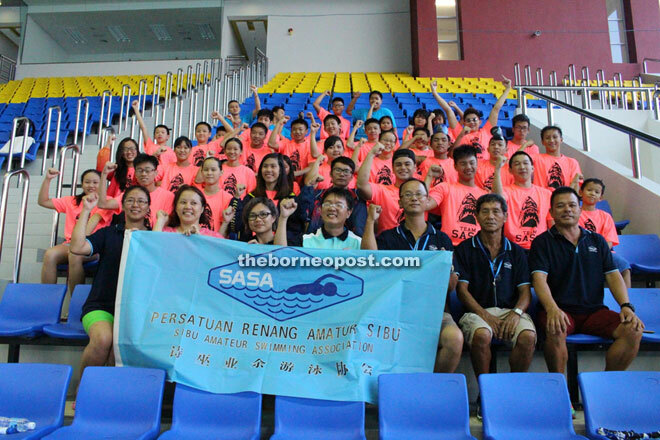 Two hundred and fifty-five swimmers from seven affiliates of the Amateur Swimming Association of Sarawak (Asas) and Sasa Special Olympics participated in the three-day swimming meet organised by Kasa 2010. Assistant Minister of Youth Development (Urban) and also Assistant Minister of Housing Datuk Abdul Karim Rahman Hamzah and Kuching City North Commission mayor Datuk Abang Wahab Abang Julai gave away the prizes. Also present were Asas president Dato Wee Hong Seng and organising chairman Anthony Kong.